The PPNB settlement in southeastern Turkey for which we have the largest sample as well as the longest sequence is Cayonu near modern Diyarbekr. 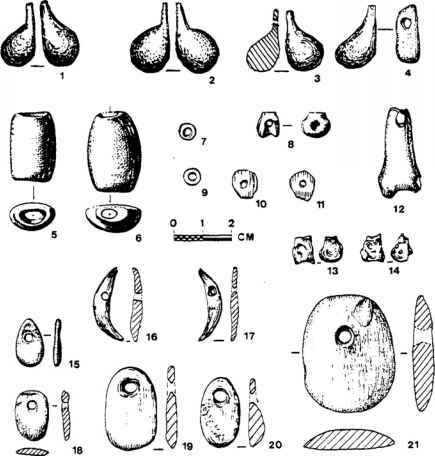 The site was excavated between 1964 and 1991, exposing nearly 5,000 m2 (c. 22%) of the Pre-Pottery Neolithic settlement, with six occupation phases dated between 10,250and 8,000 bp (A. Ozdogan 1995:81432;M. Ozdogan 1997133444). Domestic architecture changes throughout this period, beginning with round houses, succeeded by "channel,"grill-plan, and cell-plan buildings similar to those already discussed from Nevali Cori (Cambel and Braidwood 1980; M. Ozdogan 199713; see also A. Ozdogan 1995; Ozdogan and Ozdogan 1990; Schirmer 1988). Also present are three large structures that differ in plan from contemporary domestic structures, the Flagstone, Skull and Terrazzo Buildings (Schirmer 1983;plans republished in Hauptmann 1993:Figure28). The stratigraphy at the site is complex, and the relationship of these structures has not always been clear, but detailed analysis has now shown that the buildings succeed each other chronologically and that one such structure existed during most of the PPN sequence (A. Ozdgan 1995:86 87; M. Ozdgan 1997b:445;Ozdganand Ozdogan 1990:70-72).The earliest is the Flagstone Building, with stone walls, a floor paved with large flat stones, and stele-like pillars (Cambel and Braidwood 1980:39,Pl. 1-21; the overall plan and pillars link it to Nevali Cori Building III. A comparison between Nevali Cori Building III and the latest of the Cayonu communal structures, the Terrazzo Building (Cambel and Braidwood 1980:40,Pl. 1-2, 41, Pl. 1),is preferred by Schmidt, who reconstructs two pillars in the center of a large pit, which destroyed the central part of the Terrazzo Building floor (1997:Pl.3). The only large stone sculpture from Cayonu that has been published was found in the Terrazzo Building, a stone slab with a human head sculpted in high relief on one side (Cambel and Braidwood 1980:41, Pl. 2). Hemispherical in plan, the head does have the distinctive long straight nose of the human faces from Nevali Cori. The Skull Building, chronologically intermediate within the Cayonu sequence, was in use for the longest period and was rebuilt six times with significant change in plan (M. Ozdogan 1997b:445, Figure 2). It consists of a large room with a second very narrow room to the rear of the structure. On and under the floors of the Skull Building were the disarticulated remains of nearly 300 people, including a deposit with seventy skulls recovered "during the first exposure of the building" (M. Ozdogan 1997b:445). While there is no equivalent mortuary structure known from other PPNB sites in southeastern Turkey, disarticulated human remains have been found buried beneath house floors at Nevali Cori, including one deposit with eight skulls (Hauptmann 1993:57,Pl. 17-18). At Gritille, a fragment of a human cranium was found in a pit dated to phase B. The practice of intramural burial of humans whose skeletons had presumably been exposed elsewhere until the bones were relatively clean can thus be added to the list of common ritual practices at Taurus PPNB sites.